This is an extraordinary automated desk that can increase its level working area by 40% in a matter of seconds. In its retracted position the desk has a neat, symmetrical appearance, clad in American Maple. 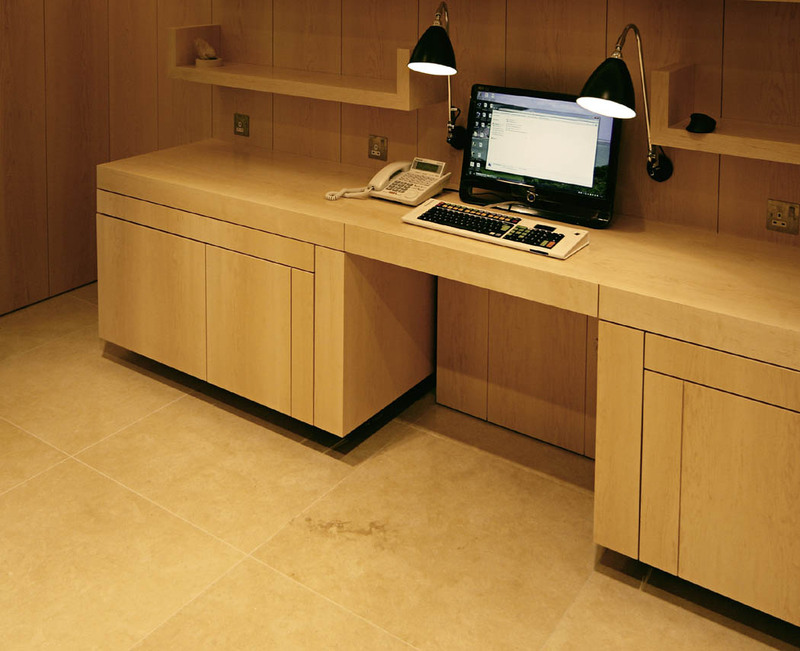 When an additional working space or a meeting table is required, a similarly clad surface appears. This rotates out from beneath one side of the desk, rising up to become flush with the desk top. Magnetic locks and guide mandrels hold it firmly in position for an absolutely stable surface. This ensures no irritating ‘wobble’ that could impede close or detailed work. The desk extension is a fully cantilevered device requiring no floor support, thus there is no barrier for user’s knees. The desk is fitted with safety beams and torque limiting to halt movement if an obstacle is detected. The safety features accommodate significant misuse, allowing up to 200kgs at the outer end of the extended leaf. The closing panel to the normal desk kneehole shifts during the rotation to allow clearance for the main hinging action. The rising cupboard beneath the rotating extension leaf contains various electronic components and thus there are various cable-ducting arrangements to make sure this is a safe movement. meia worked closely with the interior design team, main contractor and the specialist wooden cladding supplier to ensure very detailed integration of the various parties to extremely tight tolerances, in order to achieve such a beautiful result. At the end of the concept design phase we had various working concept models. Each model was pitched to the client design team along with costs to allow them to make a final selection.